Curing cannabis buds can improve the taste and smell, but it can also be disastrous if you do it wrong! Curing is a delicate process where the buds are slowly dried to remove moisture, while preserving important substances such as terpenes and cannabinoids. When you have started with good cannabis seeds, and you have taken good care of your cannabis plants during the entire life cycle, then the curing of weed can make the difference between a decent weed and a delicious weed! What are the benefits of curing weed? How long you should cure weed. Your cannabis will no longer smell like grass or hay. How long can you preserve cannabis and what is the best way. 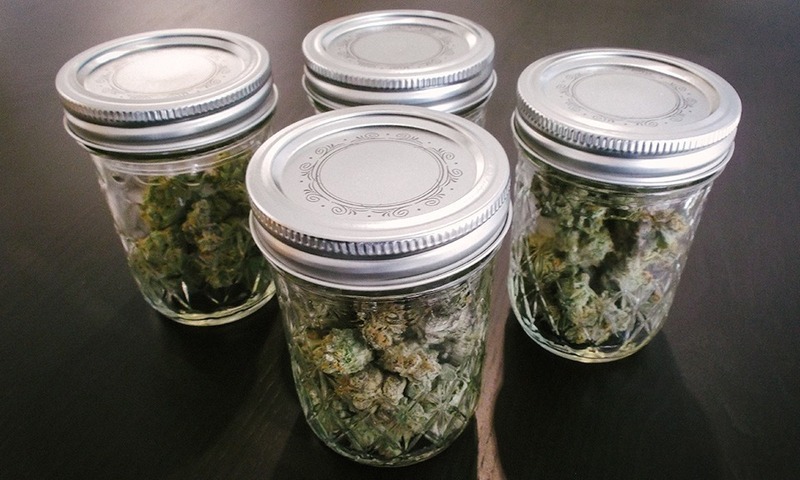 The benefits of storing weed in mason jars. And using a hygrometer.to measure the humidity. Curing ensures the breakdown of unwanted substances such as chlorophyll. Cannabis that has not been cured will smell more like grass or hay. Terpenes are important for the smell and taste of weed, while curing keeps terpenes better. Your cannabis will taste better. The potency of the cannabis would also become stronger thanks to curing. Cannabis can be stored for a longer amount of time without loss of quality. There are different ways to cure cannabis. Depending on your needs, you choose the best method. Regardless of which method you choose, the following should always be taken into account. Environmental factors have a major influence on the smell, taste and potency of your cannabis. Cannabioids break down due to environmental factors such as: light, temperature and humidity. Are you looking for a simple way to cure cannabis without having to use a hygrometer? Then use the revolutionary product: Integra Boost. These bags regulate the relative humidity. Integra Boost reacts to the environment. The bags release moisture or absorb it when necessary, ensuring a constant relative humidity of 62%. Ideal for drying and curing your weed buds. An important part of the curings process takes place during the first few days that your buds dry. During this first drying phase, the main goal is to let the cannabis dry relatively slowly, usually 3 to 7 days. During this period you must take measures to protect your buds against fungi. Ensure the correct temperature, humidity and ventilation. Most growers cut their plants immediately after harvesting and hang the tops with stem and all upside down. Then they let the plants dry until the outside of the buds is dry and the small stalks snap when you bend them. Drying your cannabis too fast is not good for the quality. When you dry cannabis buds too quickly by using a stove, dry ice or in a microwave, this is the quality. taste and smell are not good. In fact, even drying in mildly hot temperatures, such as (30 ° C), can cause valuable odors (terpenes) and possibly certain cannabinoids to be lost. When you dry cannabis buds too quickly, you completely skip the most important part of the curings process! Depending on your situation, you choose the right drying method. A drying rack is a quick way to dry cannabis. When you live in a humid climate, or have a small drying room, a drying rack is very suitable because it reduces the risk of fungi such as budrot. Temperature can affect the breakdown of cannabis in different ways. Ideally, cannabis should be stored at temperatures of up to 21 degrees. A higher temperature is conducive to the growth of bacteria and fungi in your cannabis buds. Cannabinoids begin to decarboxylate and / or break down when exposed to prolonged high temperatures. THCA first loses its carboxyl ring in this process and converts it to THC, which can ultimately degrade to CBN by prolonged exposure to elevated temperatures.Volatile monoterpenes start to polymerize at low temperatures, which means that the taste and aromatic profile of your weed may change. When cannabis is kept extremely cold, for example in a freezer, this involves a risk of increased relative humidity. As a result, the moisture from the inside of the cannabis buds could be forced to the surface and thus trichomes could break off in the process. Storing cannabis in the freezer? Storing cannabis buds in the freezer can be beneficial if you want to store them for a long period of time. The best thing is to vacuum the buds or put them in preserving jars. Pay attention that the trichromes will become very fragile and break quickly. The influence of light on the quality of your cannabis. Always store cannabis in a dark place. Where temperature and humidity both have a major impact on the degradation of cannabis, high exposure to UV light and oxygen may cause the greatest damage in the shortest period of time. UV rays will sever the organic material to a large extent, the active substances in cannabis, the cannabioids will break down. This process can only be delayed by limiting exposure to dried cannabis. Increased exposure to oxygen can also lead to rapid degradation of cannabinoids. THC, when it is in a highly oxidized environment, will be converted to CBN more quickly, so it is important to regulate both oxygen levels and RV when curing your cannabis buds. Relative humidity is also an important factor. In general, humidity is the biggest factor that affects the drying and curing of cannabis. Humidity is often measured with the term "relative humidity" (RV), which indicates how much moisture there is in the air around the product. The ideal relative humidity for curing weed is between 59% and 63%. When you let cannabis cure in mason jars, it is important that the buds are already reasonably dry. The outside should not feel wet, the branch and the inside of the bud should not be dry. Depending on the circumstances, your weed is dry enough after 3 to 7 days to be cured in preserving jars. To ensure that molds do not have a chance to ruin your harvest, you regularly check the humidity! Make sure that it is between 60 and 65%. The best way to maintain a controlled RV is to use a product that can do this exactly like Integra Boost. This humidity controller reacts to the environment. The bags release moisture or absorb it when necessary, ensuring a constant relative humidity of 62%. Ideal for drying and curing your weed buds. There are also indication strips that indicate what the RV is in the dry room, or you can buy a digital hygrometer. Integra's Boost bags can maintain 62% relative humidity or 55% relative humidity depending on your preference and needs. Both products can protect cannabis against mold during the drying process. Generally you will have nice weed after 2-3 weeks of curing, but in fact they have to cure at least 8 weeks before they develop their real character. This means that you only remove the large leaves and leave the smaller leaves (with lots of resin crystals) on them. The cannabis will dry slowly so patience is required for this method, but the aroma and smell are well preserved, the taste is softer. After 5 to 12 weeks you can remove the leaves with your hands. Important tip: When it rains one day and the humidity rises, you will notice that your buds become spongy and less dry and that this affects the taste. Then wait at least 5 days until they are dry again. and you can possibly store them in ziplock bags or glass jars.